Prairie City, Iowa - Susan Newell hikes in the Neal Smith National Wildlife Refuge. The refuge preserves the tallgrass prairie, which used to cover most of Iowa. 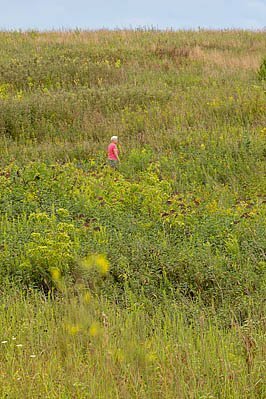 Image Description: Prairie City, Iowa - Susan Newell hikes in the Neal Smith National Wildlife Refuge. The refuge preserves the tallgrass prairie, which used to cover most of Iowa.